They burry a mama alive here. Only this man dares to rescue her. In the Russian city of Voronezh, the inhabitants of an apartment complex begin to notice a strange smell. Every time when someone uses the stairs, quiet whimpering and barking can be heard. An inhabitant named Vadim and his family decide to ask for help and advice from the local administration. Weeks before, a massive sinkhole emerged in front of the concrete staircase. Such craters are often caused by the groundwater which erodes the soil. The pit was filled by construction workers days before and paved anew. But apparently they made a serious mistake - or was it on purpose? Because it's hard to believe they didn't notice the sound of something whimpering underneath the concrete. The local government rejects Vadim's request, however. They said it was too costly to repave the sidewalk just to rescue something that might not even exist. No one wants to be responsible for the resulting costs. So Vadim decides to seize the initiative himself and to break open the concrete, as time is running out. Whatever is buried below will not survive long in such conditions and will die a painful death. 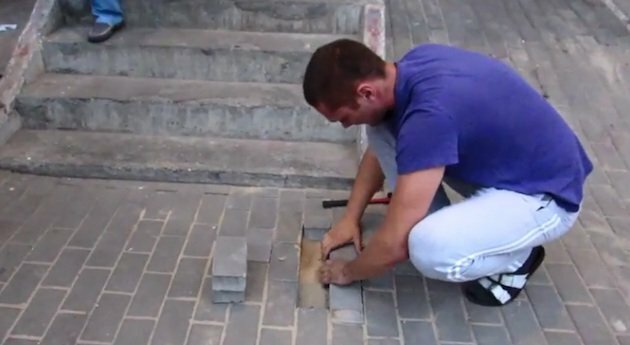 Arrived at home, Vadim begins immediately to dislodge stones with a small hammer. 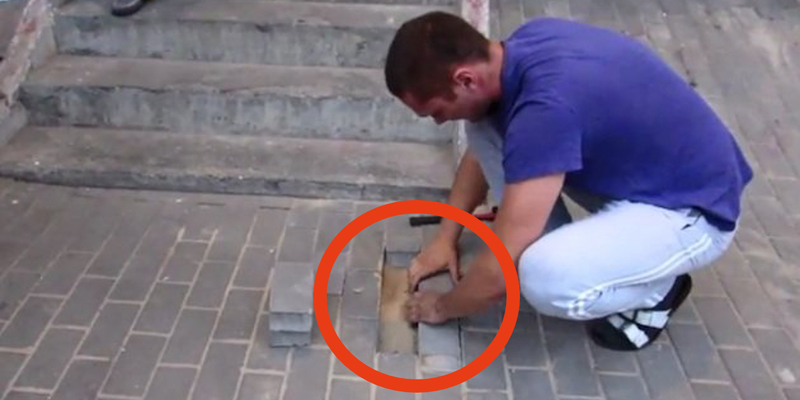 It takes quite some time before he manages to remove the first stone. But it gets easier and easier. He works this way for hours. Able to access the ground, he begins to scoop out the sand underneath with his bare hands. The clock is ticking! 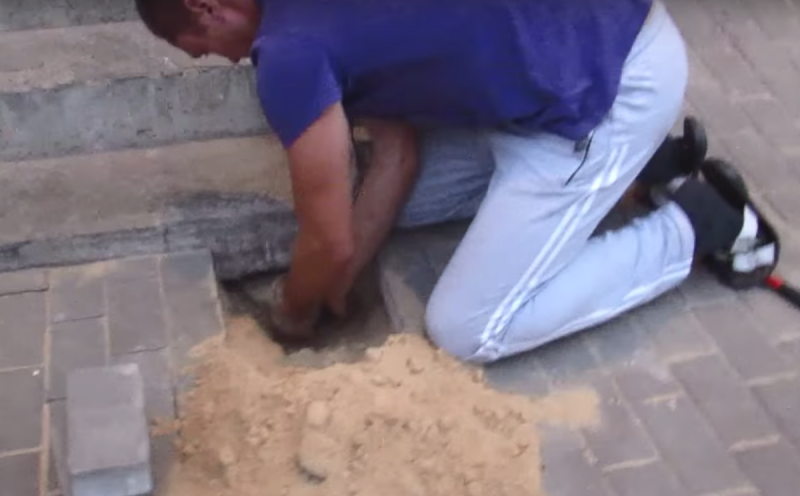 He borrows until he trenches a narrow shaft under the last step of the staircase. Then two sparkling eyes beam out of the darkness suddenly. 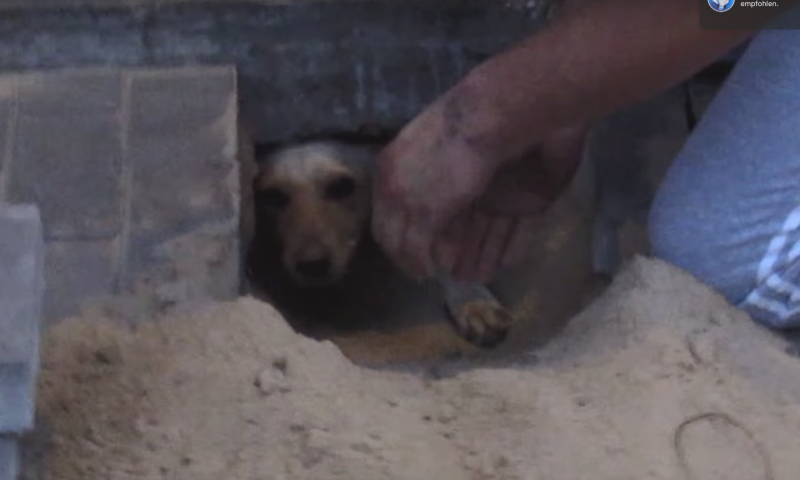 A blonde labrador emerges, protruding her head out of the hole that her rescuer dug. Vadim grabs the dog by the front legs and carefully lifts her out of her dungeon. He notices immediately that the animal is rounder than it normally should be after days without food. The young pup is pregnant. At first glance, she doesn't have a scratch on her at all, despite being stuck under the stairs the entire time. Nothing has befallen her and her puppies-in-waiting. 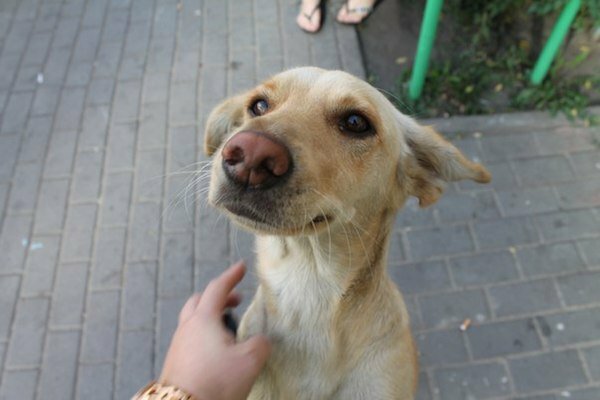 No one can say for certain if the paving over of the dog was an accident or intentional. 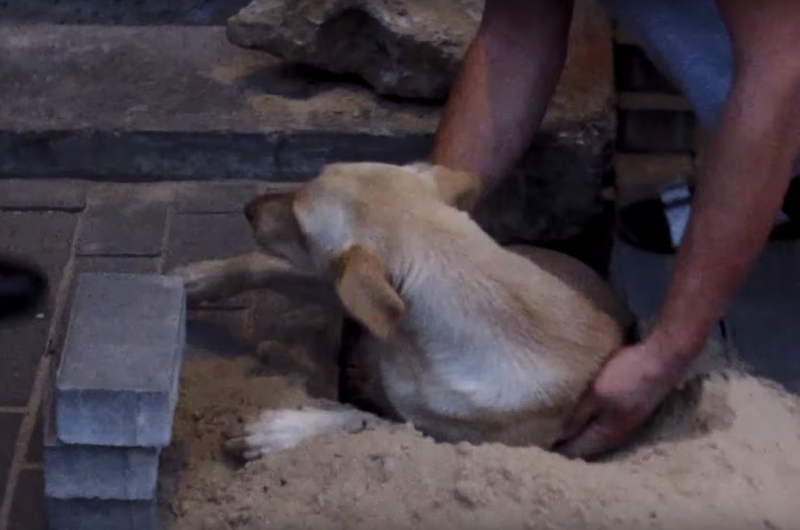 Nothing has been ascertained that could explain how a living mama dog was buried alive. If Vadim hadn't been so selfless - daring to disobey the local government - the mama dog and her puppies would have perished in their stony dungeon. 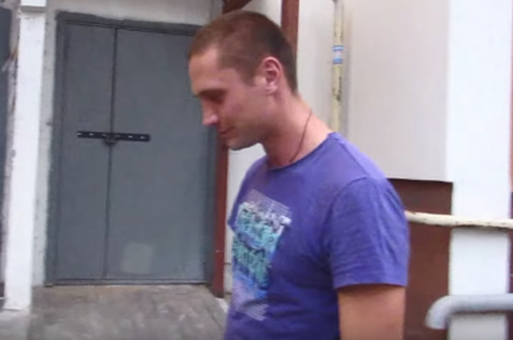 Thankfully there are people like Vadim, who will raise hell to save an animal. Even if they don't know what kind of animal is actually whimpering in the dark. Vadim visits the mama dog a week after the rescue. Her new name is Belka and has been taken up by a local animal shelter. She recognizes him and his family and is excited to see her guardian angel Vadim again! And she gives her thanks to him in her own special way. If you were just as impressed by Vadim's wonderful stubbornness and think that there should be more people who don't just give up and who risk everything to save another life, then share this story wit everyone that you know!